The first member of our family to put a seed in this Alberta soil was Wilhelm Forth way back in 1893! 5 generations later we are still here: tilling the same earth and using many of the same all natural methods our fore fathers used. Current farm stewards, Ian and Jennifer Forth are committed to providing clean food and clean people to improve all we can about our environment. We do not use any herbicides or pesticides on our farm. Together with our sons, Thomas and Gustav we strive daily to live in peace with each other and our environment. We educate, we welcome people and we seek to do all we can to make our piece of Alberta better than we found it. Our 2017 season will include the planting of 4 acres of all natural fruits and vegetables. You can access this bounty in three ways: 1. Weekly Veggie Basket- delivered to your door in the City of Wetaskiwin, Thursday mornings June 29 thru Sept 21. 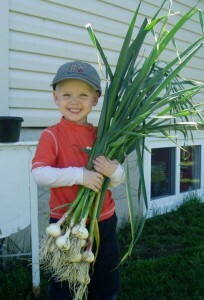 Jennifer chooses the best from her garden each week and brings it to you. $45 2. Mulhurst Bay Farmers Market-Thursdays 4-7pm beginning June 29 3. Huckleberry’s Cafe in Wetaskiwin serves our fine produce prepared in grand style all summer long!